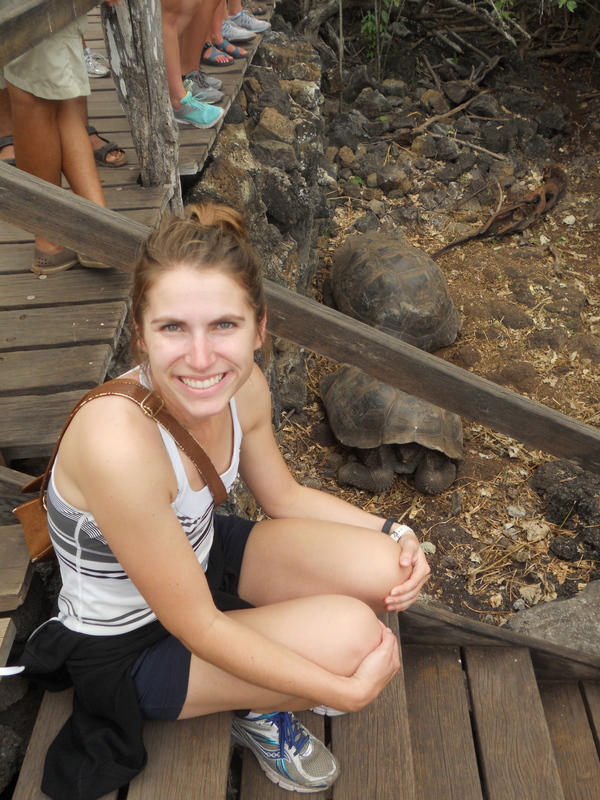 We are back on mainland Ecuador after an awesome week in the Galapagos with Jennifer! 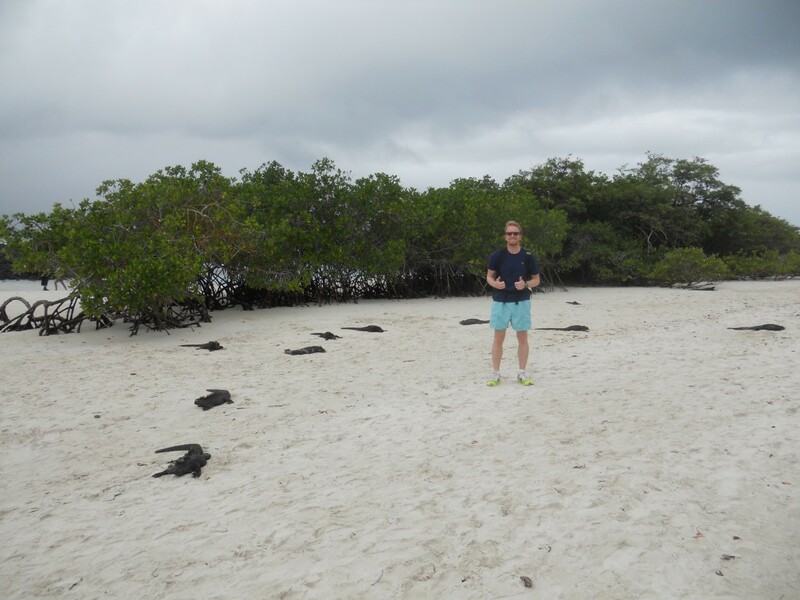 With so many experiences and cool animals, I’m breaking our trip into 2 different posts – one for each island we stayed on. 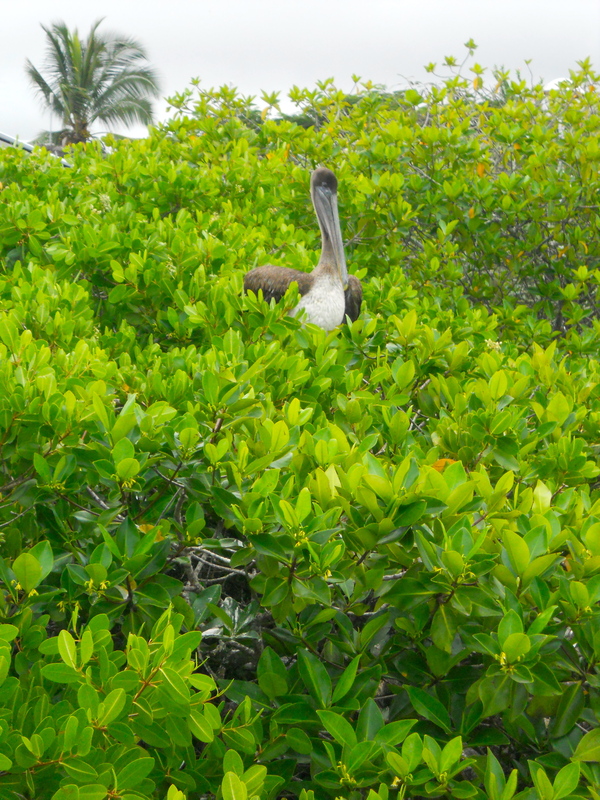 We flew from Guayaquil to Baltra – a tiny island in the Galapagos with just the airport. 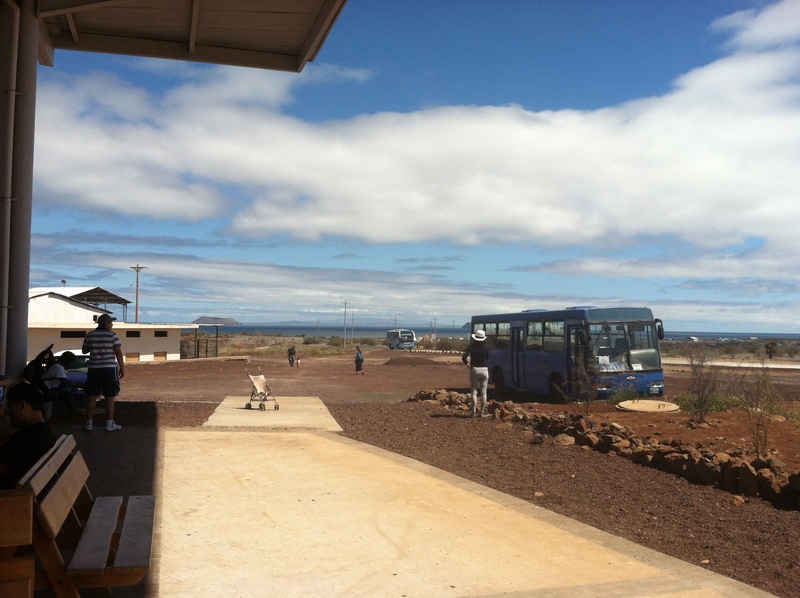 To get to Santa Cruz, the most populated island, we had to take a bus and a ferry and then another bus and a taxi to get to our hostel in the largest town, Puerto Ayora. 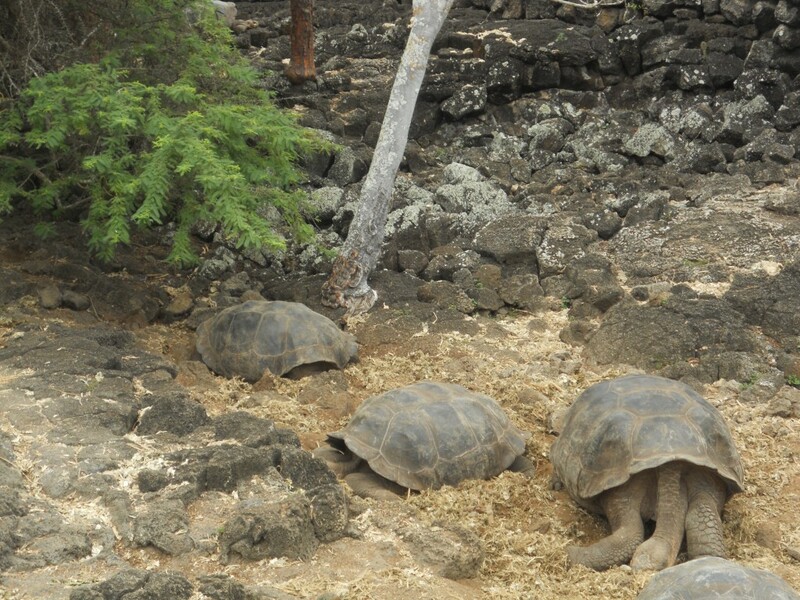 After checking in, we explored town and went to the Darwin Research Center and saw a ton of huge tortoises! 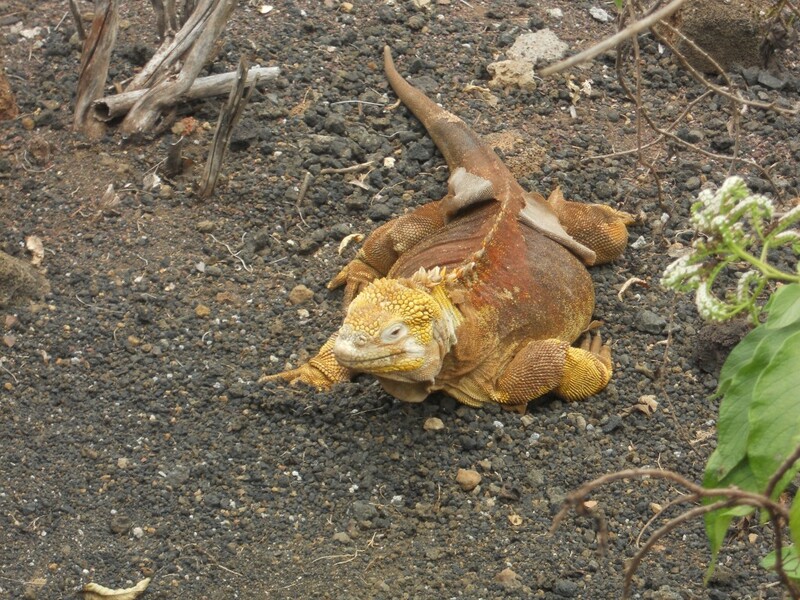 Besides the giant tortoises, the center was a bit of a let down – we didn’t see too many other cool animals except a land iguana. 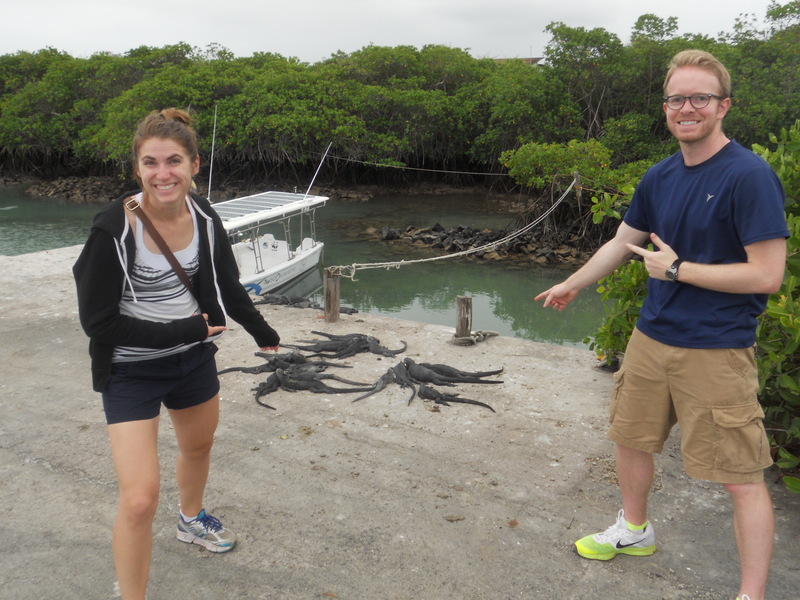 The cool part about the Santa Cruz (and Isabela, the other island we stayed on) was just walking down the street and seeing a bunch of iguanas on the dock, pelicans trying to steal fish or sea lions taking a nap. 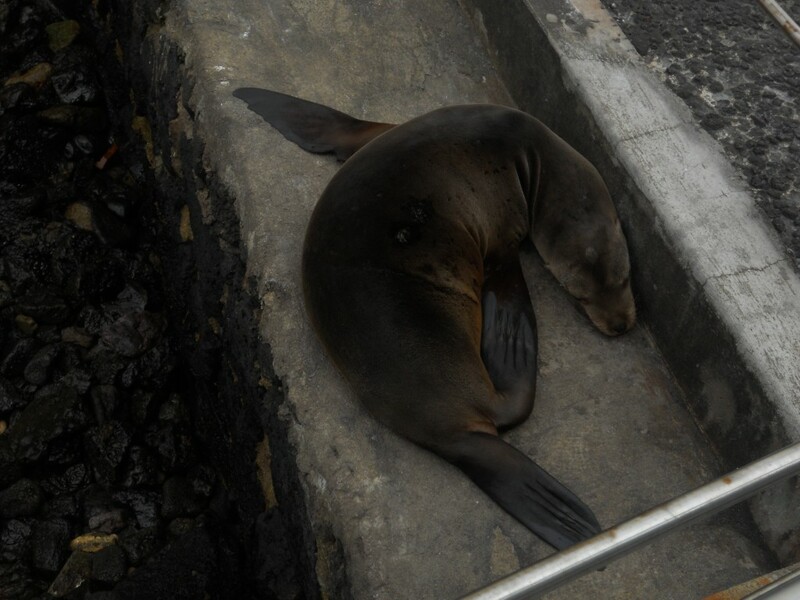 Most of the meals we ate on Santa Cruz were consumed on what we called “cheap street”. 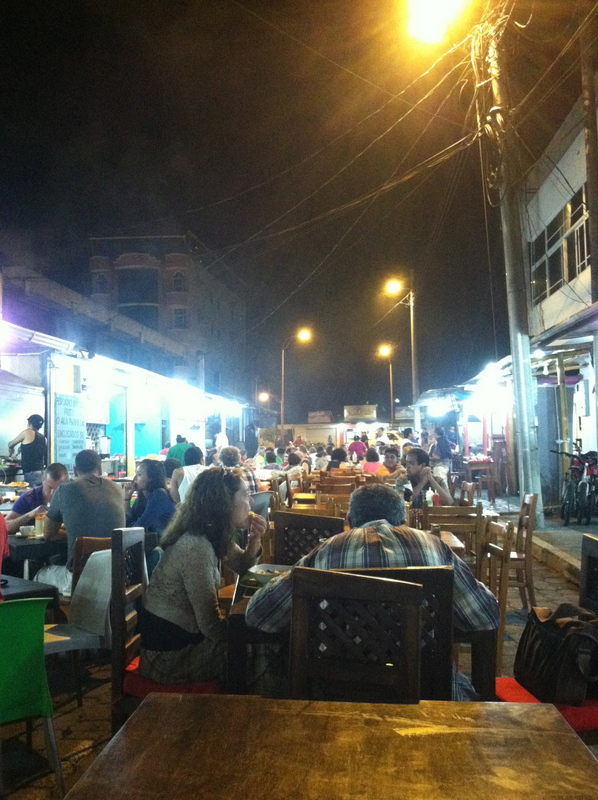 There was a street a few blocks off the main drag that had typical cheap almuerzos (lunch specials) and at night, the little restaurants pulled tables out into the street and the atmosphere was really fun! After we got back from spending a few days on Isabela (more on that in a day or two), we explored Santa Cruz a little more. 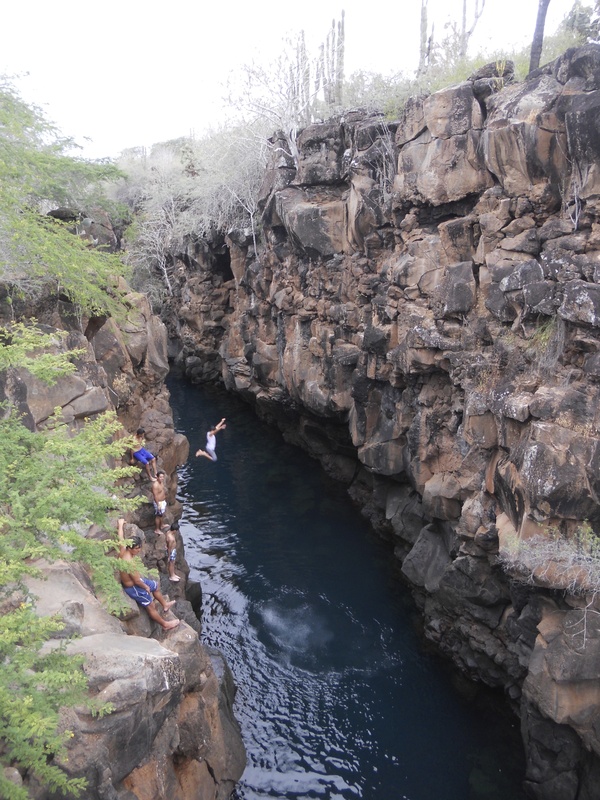 We visited Las Grietas, a really cool swimming hole in the middle of tall cliffs. 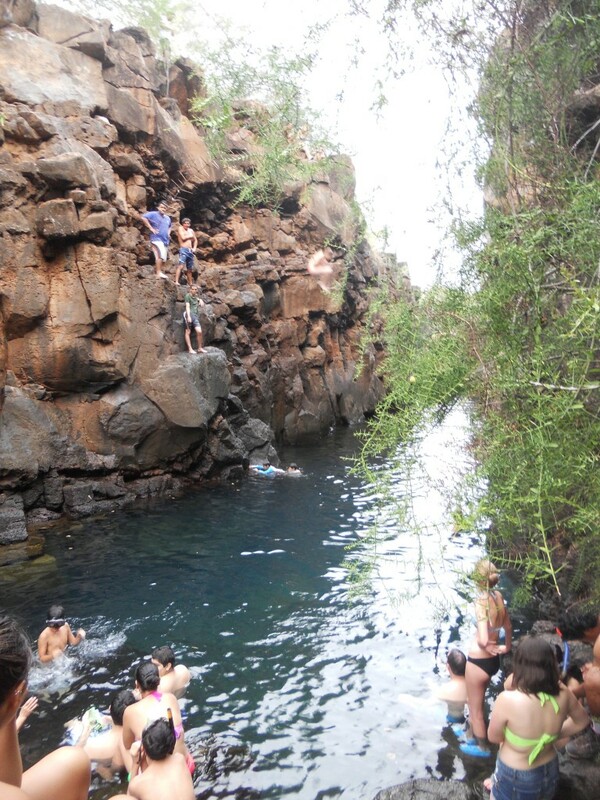 Both Jen and I climbed about half way up and jumped in – the second picture is Jen’s blurry cannonball! 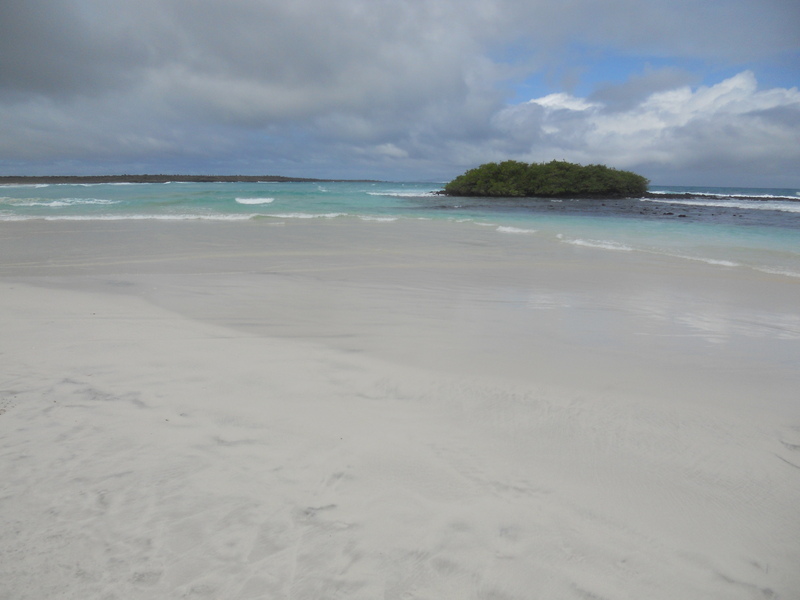 We also visited the most gorgeous beach I have ever seen – Tortuga Bay. It was a bit of a hike to get to, but breathtaking. 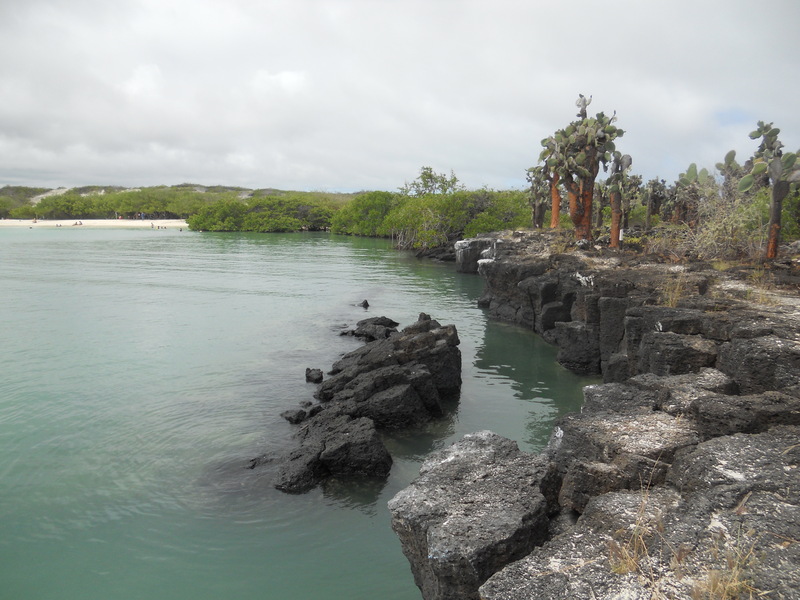 There were tons of cool cactus trees around it and of course, more iguanas. 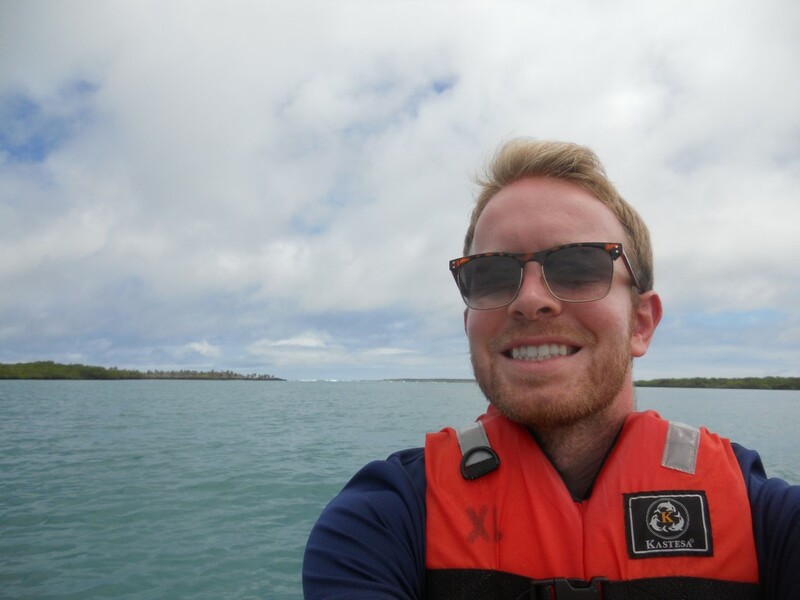 Brandon and I took a kayak out on the water to try to spot more wild life but only saw fish and a sea lion darting around. So glad that you are enjoying your trip (vacation?) Keep posting; it is all so interesting. Thanks! We’re having a blast.